This article is about the former consumer bank. For other uses, see Northern Rock (disambiguation). Not to be confused with Northern Bank. Northern Rock, formerly the Northern Rock Building Society, was a British bank. It was based at Regent Centre in Newcastle upon Tyne, United Kingdom. Northern Rock was best known for becoming the first British bank in 150 years to suffer a bank run after having had to approach the Bank of England for a loan facility, to replace money market funding, during the credit crisis in 2007. Having failed to find a commercial buyer, it was taken into public ownership in 2008, and was then bought by Virgin Money in 2012. During 2012 the Northern Rock brand was phased out and replaced by Virgin. Northern Rock Building Society became Northern Rock bank in 1997 when the society floated on the London Stock Exchange (with the ticker symbol NRK). On 1 January 2010 it was split into a 'good' and a 'bad' bank, the "Northern Rock" brand was transferred to the good bank and the other division was renamed Northern Rock Asset Management (NRAM), with its own unique branding. Northern Rock Building Society was formed in 1965 as a result of the merger of two North East Building Societies; the Northern Counties Permanent Building Society (established in 1850) and the Rock Building Society (established in 1865). During the 30 years that followed, Northern Rock expanded by acquiring 53 smaller building societies, most notably the North of England Building Society in 1994. Along with many other UK building societies in the 1990s, Northern Rock chose to demutualise as a building society and float on the stock exchange as a bank. Throughout this period a concern against demutualisation was that the assets of a mutual society were built up by its members throughout its history, not just by current members, and that demutualisation was a betrayal of the community that the societies were created to serve. Northern Rock chose to address these concerns by founding the Northern Rock Foundation, which funded community-based projects. At its Stock Exchange flotation Northern Rock distributed shares to members with savings accounts and mortgage loans; the flotation share price was £4.51908. It joined the stock exchange as a minor bank and was expected to be taken over by one of its larger rivals, but it remained independent. In 2000 Northern Rock gained promotion to the FTSE 100 Index, but was demoted back to the FTSE 250 in December 2007 and later suspended from the LSE on nationalisation. On 14 September 2007, during the financial crisis of 2007–2010, the Bank sought and received a liquidity support facility from the Bank of England, following problems in the credit markets caused by the financial crisis of 2007-2008. The bank was more exposed than others to restrictions in the supply of credit because of the way it had funded its expansion. The bank was nationalised at 00:01 on 22 February 2008 following two unsuccessful bids to take over the bank, neither being able to fully commit to repayment of taxpayers' money. In doing so the Government effectively took ownership of the insolvent institution away from its shareholders, without reimbursement. The media reported cases where some shareholders had their life savings in the shares, which were taken from them. The shares had already lost over 90% of their value prior to nationalization, and were valued at nil in an independent valuation process, as the government had not guaranteed aid. This would later form part of shareholder's action to seek compensation as, at that point, the aid was certain and the company had never stopped operating as a going concern. On 1 January 2010 the bank was split into two parts, assets and banking. In June 2011 the bank was officially put up for sale back to the private sector, and on 17 November 2011 it was announced that Virgin Money were going to buy Northern Rock plc for £747 million up front and other potential payments of up to £280 million over the next few years. The sale went through on 1 January 2012. The government said it had no plans to sell Northern Rock (Asset Management). There would be no further job losses, except for the ones already announced. Virgin also pledged to keep the headquarters of the bank in Newcastle upon Tyne. The combined business now operates under the Virgin Money brand. On 12 October 2012 Northern Rock plc was renamed Virgin Money plc, and Virgin Money Limited was renamed Northern Rock Limited. By this time the Northern Rock website had effectively become a 'soft redirect' to Virgin Money's website. People queuing outside a branch in Golders Green, London, on 14 September 2007, to withdraw their savings due to fallout from the subprime crisis. 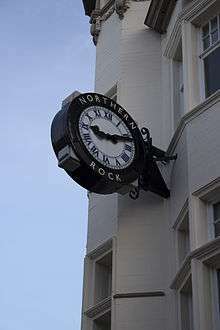 The clock outside this branch, on Northumberland Street, Newcastle upon Tyne, is emblazoned with the bank's name and has become a popular image in print and television coverage of the Northern Rock crisis. Following the Virgin rebranding this clock still features the name Northern Rock. A branch of the Northern Rock with Virgin Money branding on Briggate in Leeds. Under the chairmanship of Matt Ridley, Northern Rock had a business plan which involved borrowing heavily in the UK and international money markets, extending mortgages to customers based on this funding, and then re-selling these mortgages on international capital markets, a process known as securitisation. In August 2007, when the global demand from investors for securitised mortgages was falling away, the lack of money raised by this means that Northern Rock became unable to repay loans from the money market. This problem had been anticipated by the financial markets, which drew greater attention to it. On 14 September 2007, the bank sought and received a liquidity support facility from the Bank of England, to replace funds it was unable to raise from the money market. This led to panic among individual depositors, who feared that their savings might not be available should Northern Rock go into receivership. The result was a bank run – the UK's first in 150 years – where depositors lined up outside the bank to withdraw all of their savings as quickly as possible, particularly since everyone else was doing the same. On 22 February 2008, the bank was taken into state ownership as a result of two unsuccessful bids to take over the bank, neither being able to fully commit to repayment of taxpayers' money within three years. The bank is managed at "arms length" by the government through UK Financial Investments. The bank planned to repay the government debt within three to four years, primarily by encouraging mortgage customers to take their mortgage to another lender. Costs were also reduced by reducing numbers of staff. As of 3 March 2009, the bank was repaying the loan well ahead of target, owing a net balance of only £8.9 billion of the loan which stood at £26.9 billion at the end of 2007. By October, customers appeared to be regaining confidence in the bank, when it emerged that there had been a surge in the number of new accounts which had been opened. People perceived Northern Rock as a safe place to put their money, given that it was currently government owned. However, there was no guarantee that if Northern Rock was to fail that the government would top-up any compensation over and above the standard £85,000 offered by the Financial Services Compensation Scheme. Former shareholders and hedge funds also took legal action in January 2009 to get compensation for their shares; the shareholders lost the case. They also lost their appeals in the British courts, but hoped to take the case to the European courts. On 8 December 2009, it was announced that the valuer Andrew Caldwell had decided that the Northern Rock shareholders should get no compensation. On 23 February 2009, Northern Rock announced that they would be offering £14 billion worth of new mortgages, over the next two years, as a part of their new business plan. This new lending was partly funded by an increase in the government loan and a reversal of previous strategy to pay the loan off as quickly as possible by actively encouraging mortgage customers to leave when their mortgage deal matures. The reason for this change was government policy to increase the availability of credit. This £14 billion will be split into £5 billion in 2009 and £9 billion in 2010. Potential buyers for the bank included Virgin Money, National Australia Bank, NBNK, Santander, Blackstone, Tesco, TowerBrook, Yorkshire Building Society and Coventry Building Society. Former Chancellor of the Exchequer Alistair Darling had stated that he was in no "hurry" to return the bank to the private sector. The bank was split into two parts, assets and banking on 1 January 2010. On 15 June 2011, it was announced that the bank was to be sold to a single buyer in the private sector by the end of the year. On 22 March 2011, the bank issued its first mortgage securitisation since the 2007 recession which nearly brought the bank down. On 17 November 2011 it was announced that Virgin Money were going to buy Northern Rock plc for £747 million. The sale was completed on 1 January 2012 and by July of that year a further £73 million deferred consideration was paid by Virgin. In 2014 Virgin Money repaid a further £154.5 million that it had received as part of the refinancing package. A typical Northern Rock branch, on Northumberland Street, Newcastle upon Tyne in 2007. On 9 January 2012 it was given a temporary Virgin Money rebrand when Richard Branson visited Newcastle, and along with all other branches was fully rebranded later that year. As well as mortgages, the bank also deals with savings accounts and insurance. Home and contents insurance was dealt with by AXA whilst Legal & General, whose mortgage book Northern Rock took over, arrange life insurance investments. The bank sold credit cards until 2003, when it sold the business to The Co-operative Bank in order to free capital for its rapid growth in mortgage lending, making a profit of more than £7 million. Northern Rock continued to sell credit cards under its own brand through The Co-operative Bank until November 2007; the decision to stop was made before the 2007 crisis. In 2006 the bank had moved into sub-prime lending via a deal with Lehman Brothers. Although the mortgages were sold under Northern Rock's brand through intermediaries, the risk was being underwritten by Lehman Brothers. At the time of being bought by Virgin the bank had 75 branches that have since been re-branded under the Virgin Money name. In 2012 Northern Rock began to provide Virgin-branded savings accounts. The Northern Rock House buildings at Regent Centre in 2011. The black coloured buildings were completed in the 1990s, and the sandstone coloured buildings that can be seen in the background were completed in the 2000s. The Northern Rock sign has since been changed to a Virgin Money logo. The bank was based on a large site at the Regent Centre in Gosforth, Newcastle upon Tyne called Northern Rock House. It had customer contact centre operations at both North of England House in Doxford International Business Park in Sunderland and at its head office. The bank developed a site at Rainton Bridge, which it sold to Npower. Northern Rock completed the redevelopment of the Gosforth site, Northern Rock House, in the 2000s, which saw the development some new buildings as well as the demolition of their original 1960s tower block during Spring 2006. A new tower block, simply known as The Tower, was completed in November 2008, originally intended to create 1500 jobs, and act as the main entrance and focal point of the company headquarters. The local council, Newcastle City Council, purchased the building for £22 million, and leased it to a green support services company, Eaga (now Carillion Energy), as it was surplus to the bank's requirements at the time. The Kielder and Prudhoe buildings of the Gosforth site were completed in the early 1990s, behind which lies the distinctive glass-fronted Alnwick building. The main Atrium reception is adjacent to this, opening out onto Baker Street, a large covered atrium that housed a restaurant, shop and on-site branch. A number of other buildings, all named after North-Eastern castles are joined to Baker Street. A sub-division in Guernsey was established in February 1996, handling offshore savings and investment accounts. The Guernsey business was shut down on 2 September 2010. 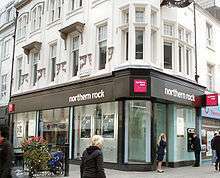 Northern Rock opened a branch in Ireland on 16 November 1999 and the first branch in Northern Ireland followed on 4 April 2007. The first branch of the bank opened in Denmark on 7 February 2007; however as part of the Government restructuring, the Danish operations ceased on 18 June 2008. The €650 million worth of Irish deposits were sold to Permanent TSB in 2011. Northern Rock logo used until 2000. In 2000 Northern Rock introduced a new corporate identity consisting of a magenta square containing the company name. This replaced the NR 'blocks' logo. The Northern Rock Foundation also changed its logo in 2003 from the NR 'blocks' inline with the main company, using the same new typeface. The Red Box Design Group designed all the currently standing buildings at the company's headquarters in Gosforth and have contributed to many of the other design aspects of the company, such as the in-branch styling. From 1 October 1997 until the government nationalisation, the bank used the symbol NRK on the London Stock Exchange. One of Northern Rock's final advertising campaigns before the purchase by Virgin was titled 'Works for Me' and featured local customers. Following the purchase by Virgin, the Northern Rock brand was gradually phased out during 2012. Upon buying Northern Rock, Virgin Money changed their logo to use both Virgin's red and Northern Rock's magenta colours. Another section of the bank's Gosforth site in 2007. Prior to the credit crisis the company had focused on developing its own staff and most appointments including the Chief Executive, were made internally. At the time of the 2007 financial crisis Matt Ridley was the Chairman and Adam Applegarth was the Chief Executive. Ridley resigned in October 2007 and Applegarth resigned in November 2007, although the latter stayed on in a caretaker role until December 2007. The Chief Financial Officer was Andy Kuipers, who joined the company in 1987. After Applegarth's departure, Kuipers became the interim Chief Executive prior to the nationalisation before retiring on 31 August 2008. In February 2008, Ron Sandler was appointed Executive Chairman by the government. Gary Hoffman became Chief Executive of Northern Rock in October 2008. With the appointment of Gary Hoffman, Ron Sandler changed to a Non-Executive Chairman position. Since the split of the bank into Northern Rock plc and Northern Rock (Asset Management) plc on 1 January 2010, each company had its boards of directors. On 4 November 2010 Northern Rock announced that Gary Hoffman had left the bank and was to move to NBNK Investments as CEO. One of the stipulations of Hoffman's appointment at NBNK was that they could not table a bid for Northern Rock for a period of 12 months. The bank sponsored Newcastle United from 2003 to 2012. The company sponsored many local sports clubs and events, including Newcastle United Football Club, Newcastle Falcons (rugby union), Newcastle Eagles (basketball), Durham and Middlesex County Cricket clubs, professional golfer Paul Eales and the cycling festival Northern Rock Cyclone. The sponsorship of Newcastle United began in 2003, and was set to expire in 2010, before an extension to 2014. However this extension included a get-out clause in June 2012, which was activated in November 2011. While under government control the bank continued their sponsorship agreement. The five-year deal from 2005 to 2010 was worth £25 million, and the 4-year extension was to be worth between £1.5 million and £10 million. In 2012 after Virgin bought the bank, Virgin Money signed a 2-year deal to sponsor Newcastle United initially using the remaining time of Northern Rock's deal that was cut short; this deal was again itself later cut short. In 2005, to coincide with the Spirit of the Tall Ships Festival, Northern Rock enlisted the help of Red Box Interiors to create a temporary art installation at The Baltic Centre for Contemporary Art on the Gateshead Quay of the Tyne. The art entitled "Northern Rock @ Baltic" included mobile light stem sculptures and large scale external graphics. Northern Rock sponsored the North East Premier League competition for recreational club cricket. In 2006 Northern Rock sponsored the All*Star Cup celebrity Golf match, which was shown on ITV. The bank also sponsors a junior golf tournament, The Northern Rock Junior Golf Festival, held at Matfen Hall. In 2007, almost three weeks before the bank had to appeal to the Bank of England for an emergency loan, the bank bought the home ground of Newcastle Falcons Rugby Club, Kingston Park stadium for £15 million. In February 2008, documents relating to the sale came to light, attracting much criticism that the purchase has been made at a time of impending crisis. In late 2008 the bank sold Kingston Park Stadium to Northumbria University for an undisclosed fee. While under government control the bank continued to sponsor Newcastle Falcons; the sponsorship agreement with the Falcons came to an end before the start of the 2010/11 season. The company donated substantial amounts annually to its own independent charity, the Northern Rock Foundation. ↑ "Northern Rock confirms jobs cuts". BBC News. 29 August 2008. Retrieved 16 September 2008. 1 2 Stuckler, David; Meissner, Christopher M; King, Lawrence P (15 January 2008). "Can a bank crisis break your heart?". Springer Science+Business Media – BioMed Central. 4 (1): 1. doi:10.1186/1744-8603-4-1. PMC 2244604 . PMID 18197979. Retrieved 5 June 2010. ↑ "Northern Rock split date is set". BBC News. 8 December 2009. Retrieved 19 December 2009. ↑ "Reference numbers DT.NP, DT.NR and DX767". Tyne and Wear Archives Service. ↑ "Building societies resist carpetbaggers". BBC News. 2 January 1999. Retrieved 20 February 2008. ↑ "House of Commons Hansard Debates for 10 March 1997 (pt 28)". The Stationery Office. 10 March 1997. Retrieved 20 February 2008. ↑ "House of Commons Hansard Debates for 17 March 1997 (pt 17)". The Stationery Office. 17 March 1997. Retrieved 20 February 2008. ↑ "Anthony Hilton of the Evening Standard on the battle for Standard Life". This is Money. 19 May 2000. Retrieved 20 February 2008. ↑ "History". Northern Rock Foundation. Retrieved 8 April 2008. ↑ "Share Information – Frequently Asked Questions". Northern Rock (Asset Management) plc. Retrieved 14 January 2012. ↑ "Northern Rock drops from FTSE 100". BBC News. 12 December 2007. Retrieved 20 February 2008. ↑ "Liquidity Support Facility for Northern Rock plc – Tripartite Statement by HM Treasury, Bank of England and Financial Services Authority". Bank of England. 14 September 2007. Retrieved 20 February 2008. ↑ "Northern Rock to be nationalised". BBC News. 17 February 2008. Retrieved 8 April 2008. ↑ Atkinson, Simon (18 February 2008). "Rock recovery is Sandler's goal". BBC News. Retrieved 20 February 2008. ↑ "Northern Rock confirms split plan". BBC News. 26 June 2009. Retrieved 26 June 2009. 1 2 "Northern Rock sale announced by chancellor". BBC News. 17 November 2011. Retrieved 17 November 2011. ↑ "UKFI confirms completion of Northern Rock sale to Virgin Money" (PDF). UKFI. 1 January 2012. Retrieved 1 January 2012. ↑ "UK sells Northern Rock to Virgin despite protest". Reuters. 1 January 2012. Retrieved 1 January 2012. ↑ "Chancellor announces sale of Northern Rock plc". HM Treasury. 17 November 2011. Retrieved 17 November 2011. ↑ "Virgin Money acquires Northern Rock". Virgin Group. 17 November 2011. Retrieved 17 November 2011. ↑ "Northern Rock now in public hands". BBC News. 22 February 2008. Retrieved 6 April 2008. ↑ "New company to manage Government's shareholding in banks". HM Treasury. 3 November 2008. Retrieved 3 November 2008. ↑ Treanor, Jill (31 July 2008). "Northern Rock to make 800 compulsory redundancies". The Guardian. London. Retrieved 1 August 2008. ↑ "2008 Annual Report and Accounts". Northern Rock plc. 3 March 2009. Retrieved 3 March 2009. ↑ "Commitment to Competitive Framework – Savings Product Changes". Northern Rock. 2 October 2008. Retrieved 10 October 2008. ↑ Budworth, David (3 October 2008). "Northern Rock might have to turn away savers". The Times. London. Retrieved 5 October 2008. ↑ Wearden, Graeme (13 February 2009). "Northern Rock shareholders lose compensation case". The Guardian. London. Retrieved 13 February 2009. ↑ "SRM Global Master Fund LP v Commissioners of Her Majesty's Treasury (EWHC 227)". British and Irish Legal Information Institute. 2009. Retrieved 14 February 2009. ↑ "Appeal defeat for Rock investors". BBC News. 28 July 2009. Retrieved 28 July 2009. ↑ "Appeal bid denied for Northern Rock shareholders". The Journal. 22 December 2009. Retrieved 22 December 2009. ↑ Treanor, Jill (8 December 2009). "Northern Rock investors will not get compensation". The Guardian. London. Retrieved 8 December 2009. ↑ "Northern Rock Returns to Mortgage Market". Northern Rock. 23 February 2009. Retrieved 23 February 2009. ↑ "Northern Rock unveils £14 billion bid to kick-start mortgage lending". Daily Record. 23 February 2009. Retrieved 24 March 2009. ↑ Dey, Iain (26 April 2009). 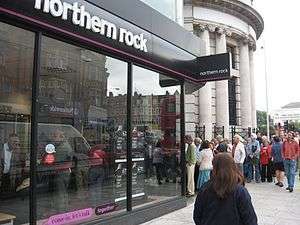 "Northern Rock to be sold by end of year". The Times. London. Retrieved 26 April 2009. ↑ "Darling promises "no rushed sale" on Northern Rock". The Journal. 28 April 2009. Retrieved 28 April 2009. ↑ "Treasury confirms 1 January restructuring of Northern Rock". HM Treasury. 8 December 2009. Retrieved 9 December 2009. ↑ "Osborne plans to sell Northern Rock to a single buyer". BBC News. 15 June 2011. Retrieved 16 June 2011. ↑ "Northern Rock launches first mortgage securitisation issue since 2007". PropertyMall. 22 March 2011. Retrieved 23 March 2011. ↑ "Virgin Money repays Treasury £150m it got in Northern Rock deal". The Telegraph. 25 July 2014. Retrieved 20 August 2014. ↑ "A month of rising mortgage rates and fees". Easier.com. 7 December 2006. Retrieved 6 August 2010. ↑ Farrell, Sean (12 February 2008). "Northern Rock and Co-op cancel credit card tie-up". The Independent. London. Retrieved 21 February 2008. ↑ "Northern Rock ups sub-prime rates". BBC. 24 August 2007. Retrieved 17 September 2007. ↑ "Stock Exchange Announcement Northern Rock PLC: Trading Statement For The 9 Months to 30 September 2006". Northern Rock. 2 October 2006. Retrieved 17 September 2007. ↑ "Rainton Bridge". Rainton Bridge. Retrieved 23 December 2008. ↑ "Redundant Northern Rock staff leave". The Press Association. 29 August 2008. Retrieved 29 August 2008. ↑ "Npower shifts 900 jobs to Sunderland". Sunderland Echo. 6 April 2009. Retrieved 6 April 2009. ↑ "Tower becomes cornerstone of campus.". Red Box Design Group Ltd. 28 November 2008. Archived from the original on 3 February 2009. Retrieved 28 February 2014. ↑ "It's boom time for Northern Rock". Evening Chronicle. 25 July 2007. Retrieved 9 October 2008. ↑ "Northern Rock tower may be sold, bank boss admits". The Northern Echo. 13 May 2008. Retrieved 6 August 2008. ↑ "New offices for Eaga". Eaga. April 2009. Archived from the original on 27 December 2010. Retrieved 28 February 2014. ↑ "About Us". Northern Rock (Guernsey) Limited. 2008. Archived from the original on 1 January 2008. Retrieved 20 February 2008. ↑ "Northern Rock closes offshore business". City Wire. 2 June 2010. Retrieved 2 June 2010. ↑ "Northern Rock celebrates 5th anniversary of Irish launch". Northern Rock Ireland. 16 November 2004. Retrieved 6 April 2008. ↑ "About Northern Rock plc". Northern Rock plc. Archived from the original on 23 February 2007. Retrieved 28 February 2014. ↑ "Northern Rock sells Irish deposits to Permanent TSB in €650m deal". Irish Independent. 31 August 2011. ↑ "Northern Rock Building Society Headquarters.". Red Box Architecture. Archived from the original on 13 February 2009. Retrieved 28 February 2014. ↑ "Northern Rock 1994". Red Box Architecture. Archived from the original on 13 February 2009. Retrieved 28 February 2014. ↑ "Northern Rock Campus Development Phase 2". Red Box Architecture. Archived from the original on 13 February 2009. Retrieved 28 February 2014. ↑ "Northern Rock 2005". Red Box Architecture. Archived from the original on 13 February 2009. Retrieved 28 February 2014. ↑ "Northern Rock - Phase 4". Red Box Architecture. Archived from the original on 13 February 2009. Retrieved 28 February 2014. ↑ "Northern Rock Tower". Red Box Architecture. Archived from the original on 15 February 2009. Retrieved 28 February 2014. ↑ "Northern Rock Roll-out". Red Box Architecture. Archived from the original on 15 February 2009. Retrieved 28 February 2014. ↑ "Stock Exchange announcement – Northern Rock plc update". Northern Rock. 13 December 2007. Retrieved 15 October 2008. ↑ "New Northern Rock boss appointed". BBC News. 23 July 2008. Retrieved 23 July 2008. ↑ "Board appointments at Northern Rock". Northern Rock. 15 December 2009. Retrieved 19 December 2009. ↑ "Directorate Change". Northern Rock. 4 November 2010. Retrieved 4 November 2010. ↑ "Magpies extend sponsorship deal". BBC News. 20 April 2004. Retrieved 8 April 2008. ↑ "Sponsors". Northern Rock Cyclone. Retrieved 13 October 2008. ↑ "Northern Rock plc to sponsor Newcastle United". Northern Rock plc. 18 January 2010. Retrieved 18 January 2010. ↑ "Northern Rock Newcastle United sponsorship deal ended early". BBC News. 11 November 2011. Retrieved 17 November 2011. 1 2 Bond, David (21 February 2008). "Newcastle seek Northern Rock talks". The Daily Telegraph. UK. Retrieved 6 April 2008. ↑ "Virgin Money to sponsor Newcastle United Football Club". Virgin Money. 4 January 2012. Retrieved 4 January 2012. ↑ "Northern Rock @ Baltic". Red Box Interiors. Retrieved 6 April 2008. ↑ "About us". Play Cricket – North East Premier League. Retrieved 9 October 2008. ↑ "Red Carpet" (PDF). Northern Rock. 2006. Retrieved 2 October 2008. ↑ "Rock in swing with Ant 'n' Dec". The Journal. 1 June 2006. Retrieved 2 October 2008. ↑ "Have a free go at golf". Newcastle upon Tyne, UK: The Journal. 24 May 2007. Retrieved 15 October 2008. ↑ Griffiths, Katherine (28 February 2008). "Northern Rock bought rugby fields three weeks before crisis". The Daily Telegraph. UK. Retrieved 28 February 2008. ↑ "Northumbria University buys Newcastle Falcons' ground". The Journal. 4 December 2008. Retrieved 8 December 2008. ↑ "Northern Rock ends long-standing Newcastle Falcons deal". BBC News. 3 June 2010. Retrieved 3 June 2010. Wikimedia Commons has media related to Northern Rock.